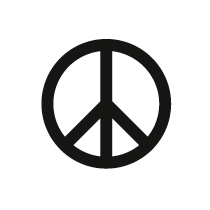 The internationally well known Peace Symbol was designed 1958 by the British artist Gerald Holtom, as the logo for the British Campaign for Nuclear Disarmament (CND). 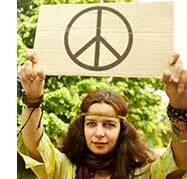 Later, the Peace Symbol was spread more widely by anti-war activists in the United States and other places around the world. Gerald was initially going to use the Christian symbol, the cross and place it in the circle of the symbol, but he first asked some priests for their opinions. Then they did not like it, he changed his mind. The Peace Symbol is a combination of the semaphore signals (formed by a person holding two flags) for the letters"N" and "D" standing for "Nuclear Disarmament".